And then the Sales Rep from AAT Kings came to my desk, a few days before the 29th of May. 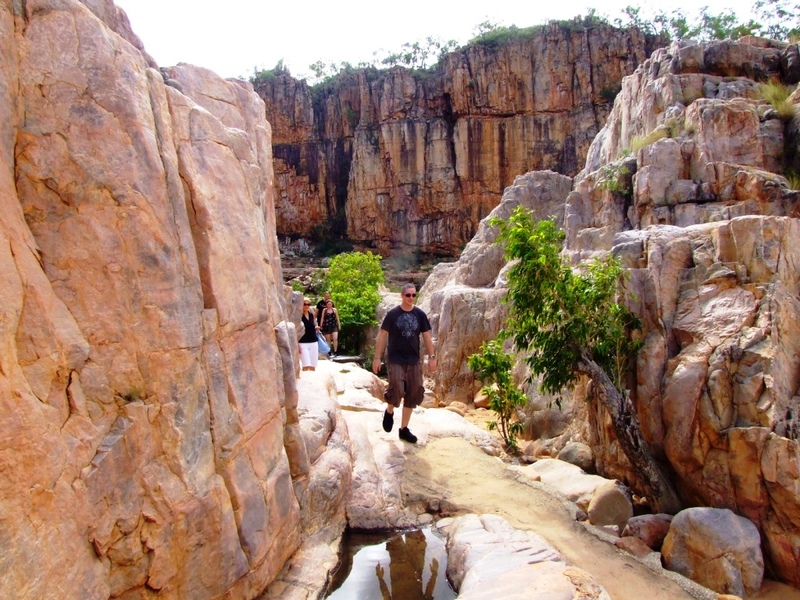 “Simon, are you still coming to the Katherine Gorge famil?”, she said. “It’s this Saturday, right?” I asked her. Good, that I can join them, I thought, I have a day off that day. 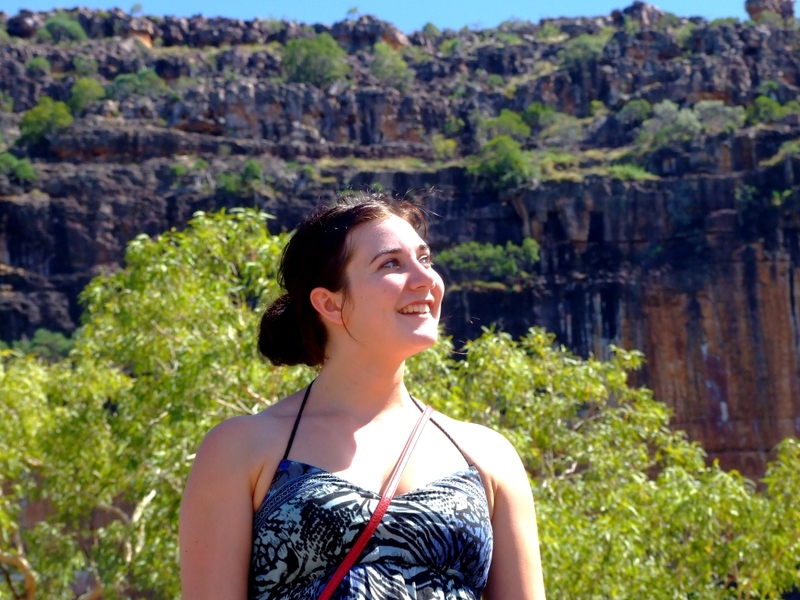 But bad, that this is my only day off and I knew, Katherine Gorge is not around the corner. Getting up at 5 am to be ready for the bus pickup at 6 am at Crowne Plaza and not returning before 8.30 pm – that’s a long day! I tried to find people who would join me, but some cancelled their RSVP, even those who worked a lot less than me. 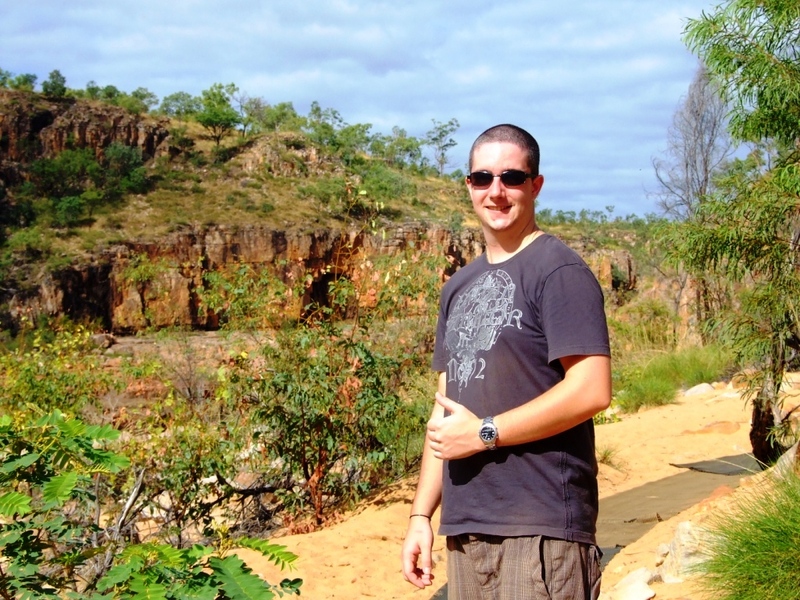 “Niall, you wanna come to Katherine Gorge on Saturday?” He is a good friend from the Food & Beverage Department. “How much is it?” he asked. “For free. It’s a famil. We’ll get a cruise and free food.” I answered. So there we went. We were tired, but ready to go. It was 6.05 am, when the AAT Kings bus showed up. Lucky I packed my pillow. The first couple of hours were just a long ride on the highway. Most of that time I hugged my pillow, falling asleep, waking up from annoying comments of the bus driver, or should I say, ‘tour guide’ and falling back to sleep. It was a good tour guide, his comments were just annoying to me, because I was tired. And I can get grumpy when I’m tired. 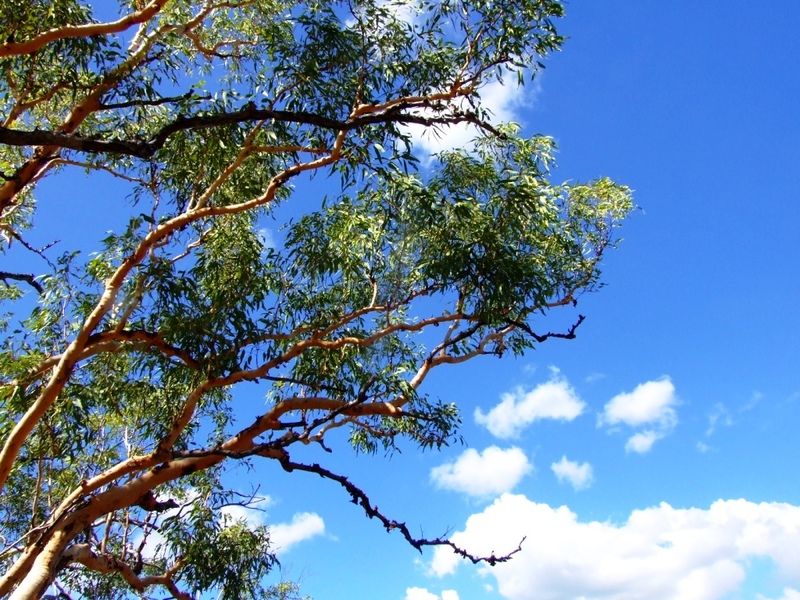 We stopped in a little town called Adelaide River, where people went inside a restaurant to have a little brekky. Me and Niall had our own breakfast. Energy drink, chocolate bar, a smoke. And back on the bus, where I continued hugging my pillow. 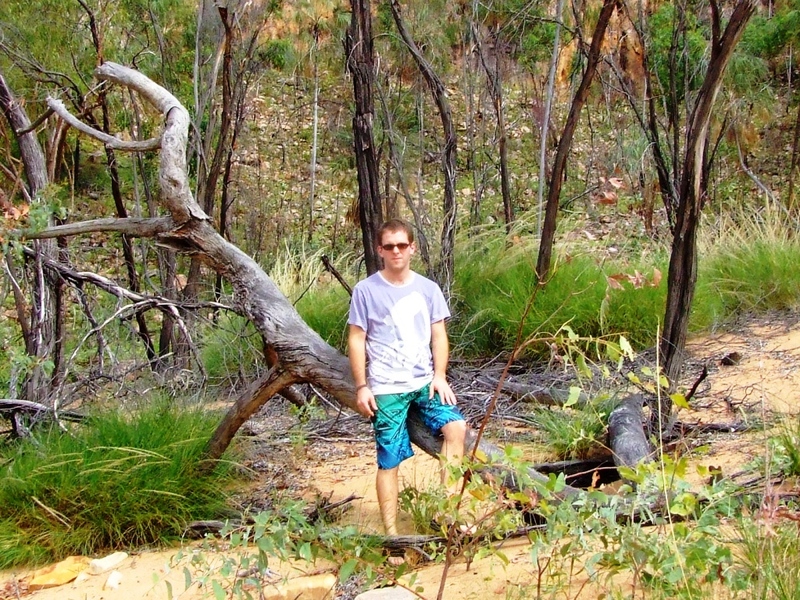 After a nother not very restful nap we arrived in Edith Falls at around 11 am. 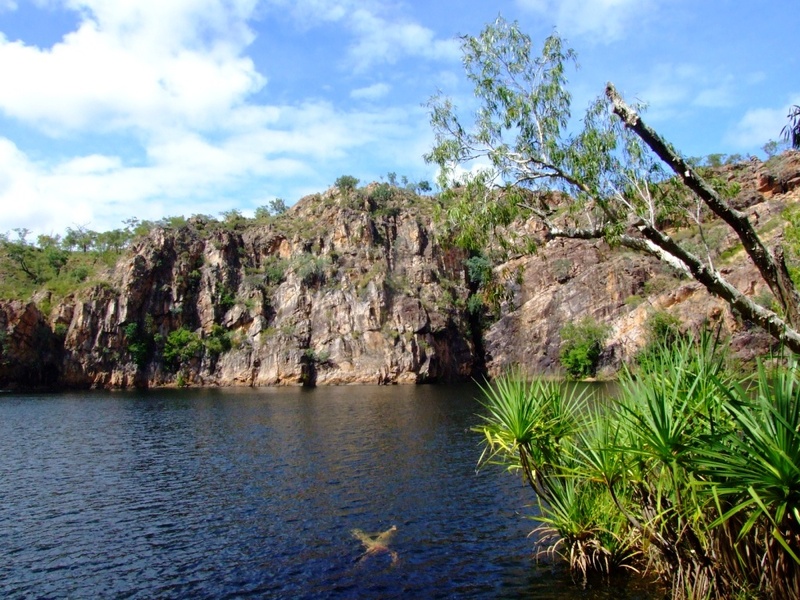 Left: Edith Falls, where Niall and me swam all the way over to the Falls. 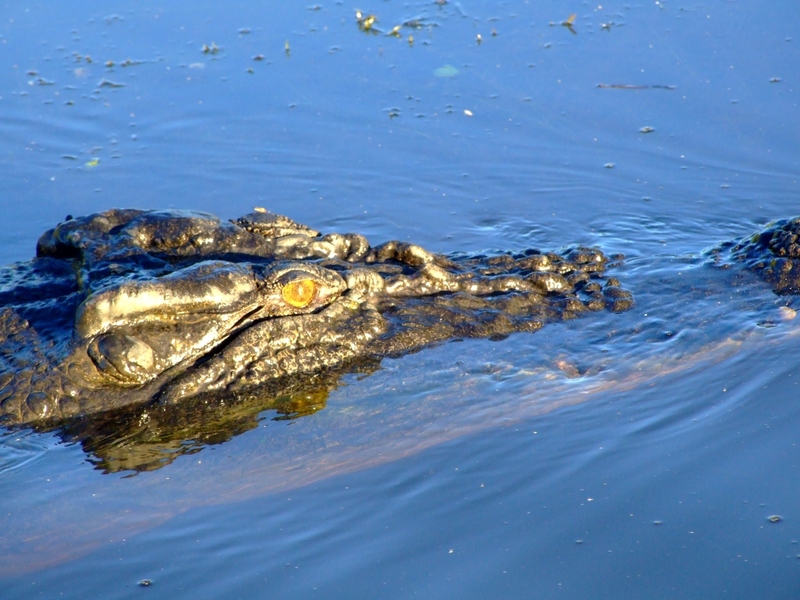 Middle: There were signs warning about saltwater crocodiles. However we didn’t get to see (or feel) any while we swam across. 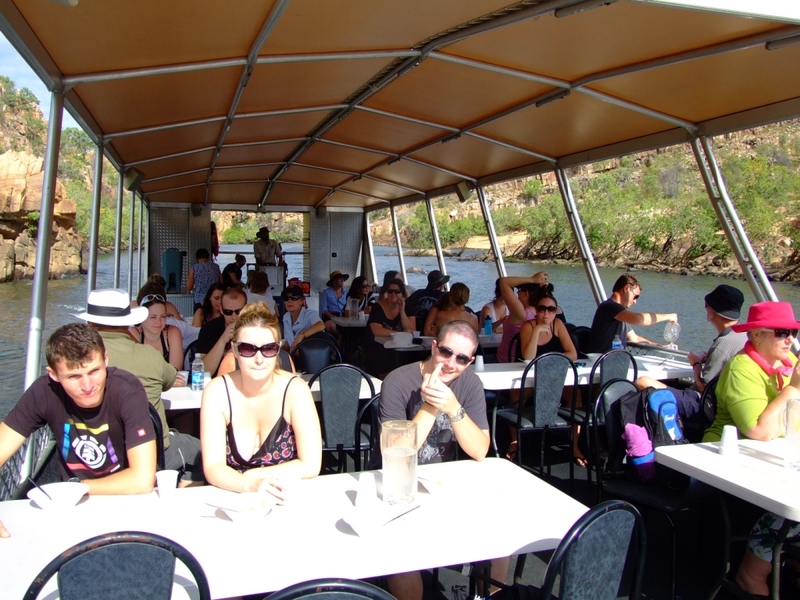 Right: After the swim at Edith Falls we continued to Katherine Gorge where we boarded a couple of cruise ferrys and enjoyed lunch on the boat. Left: The beach at which we landed. Because the water level gets low in the dry season, we had to stop here with the first ferry and walk five minutes to the second ferry that was waiting for us where the water was deep enough again. Middle: Niall enjoying the walk. Right: Me posing rather awkwardly for a photo. 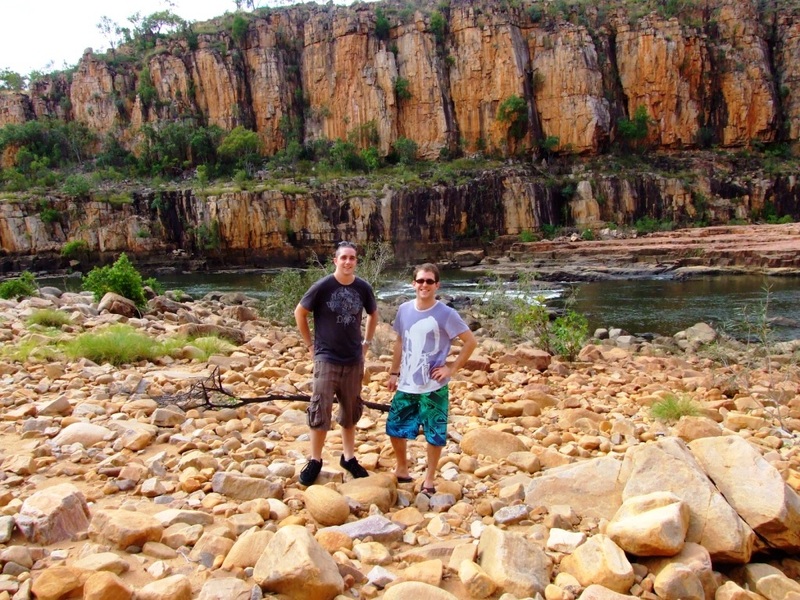 Left: Niall and me posing in front of the huge cliffs at Katherine Gorge. 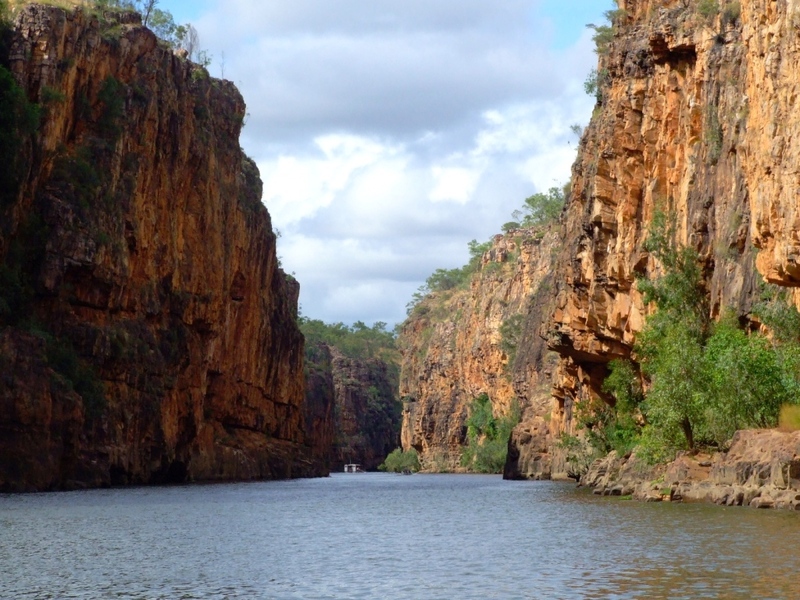 Middle: The most famous part of Katherine Gorge. 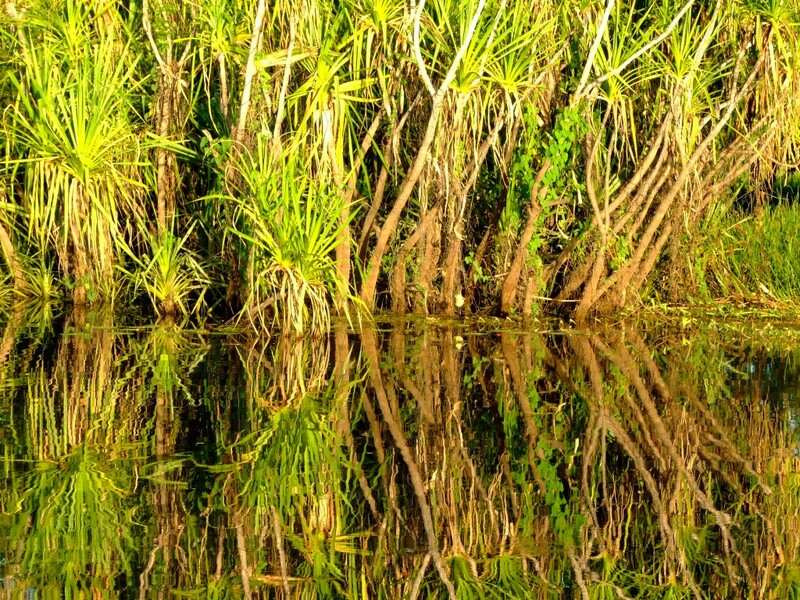 In the wet season, the water would be several metres higher. In the dry, the water sinks down, sometimes making it impossible for the boats to get as far as this. 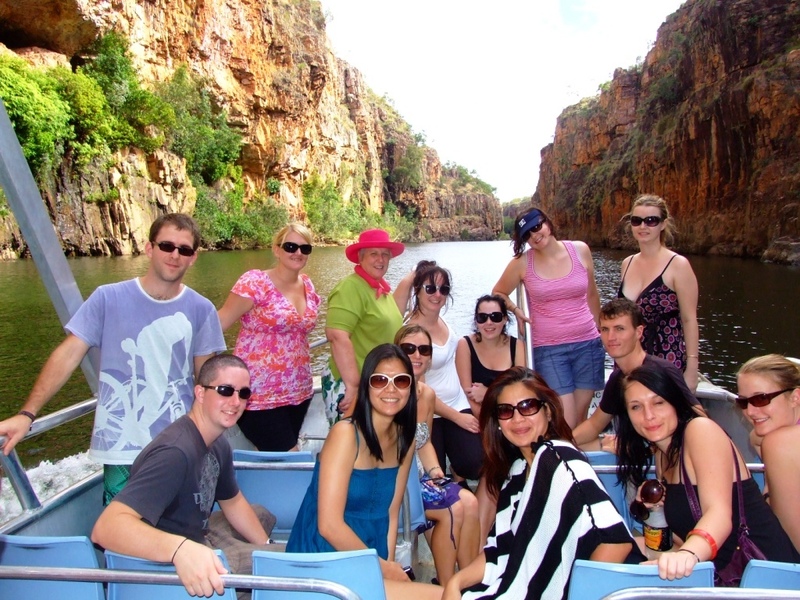 Right: Niall, me and other guests from the AAT Kings Katherine Gorge famil. Left: The weather was awesome the entire day. 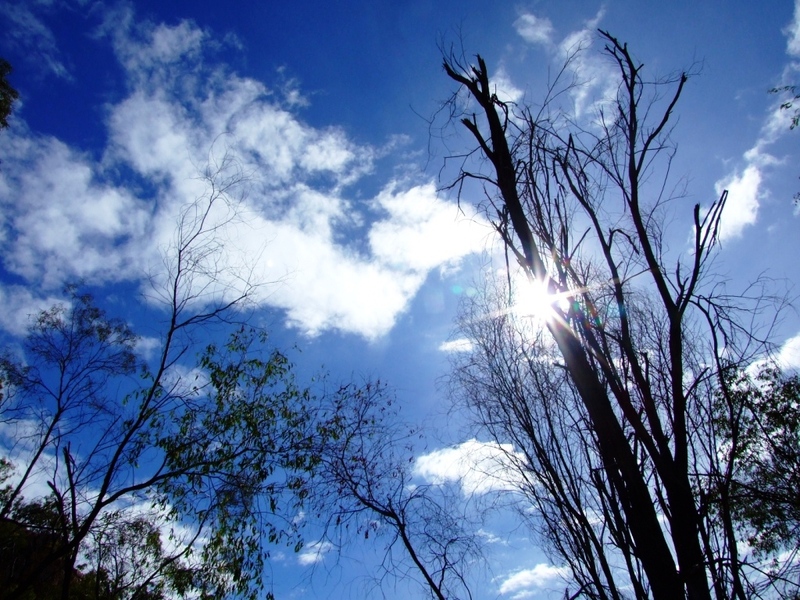 No clouds and 32 Celsius, just like it is almost every day in and around Darwin. Middle: Niall enjoying the tour. 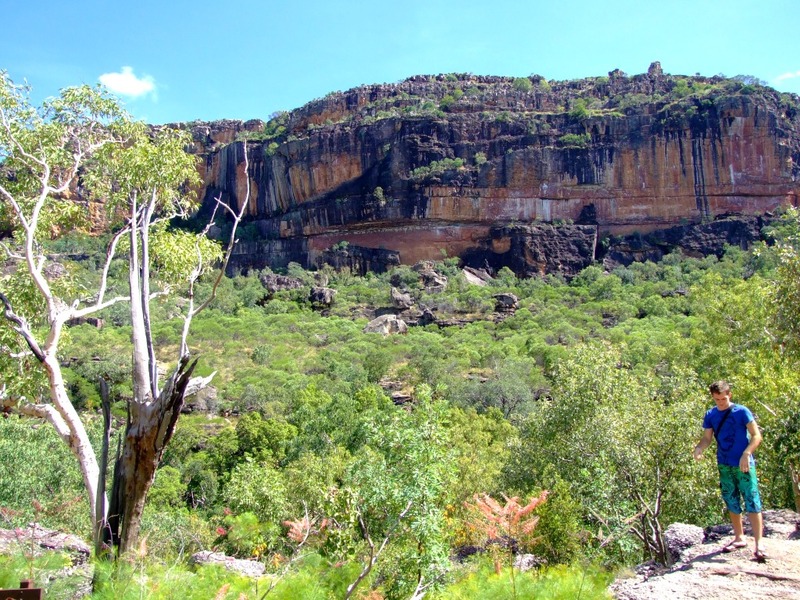 Right: Cliffs and trees in Katherine Gorge. Left: Maybe Niall got annoyed with me because I was running around with my camera like a japanese tourist, taking photos of pretty much every rock and every tree. 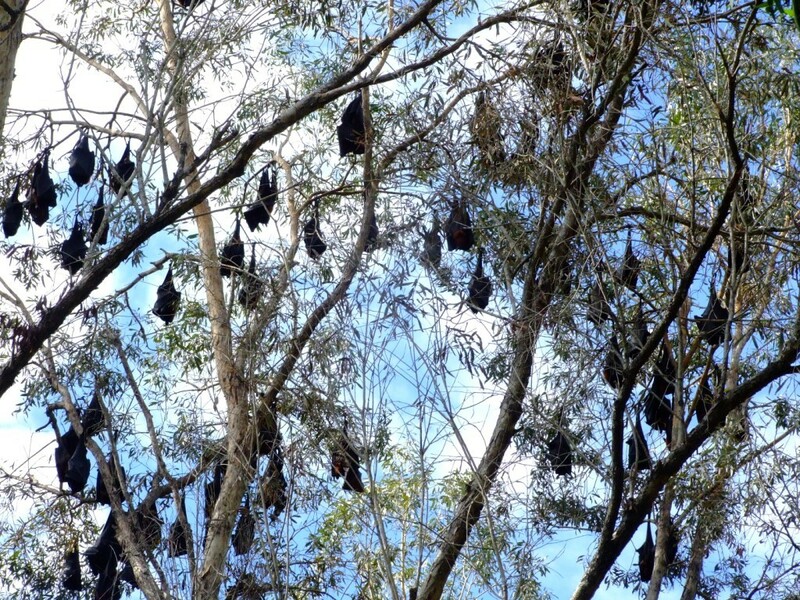 Middle and right: Bats, Bats and Bats (oder zu deutsch, Flughunde). 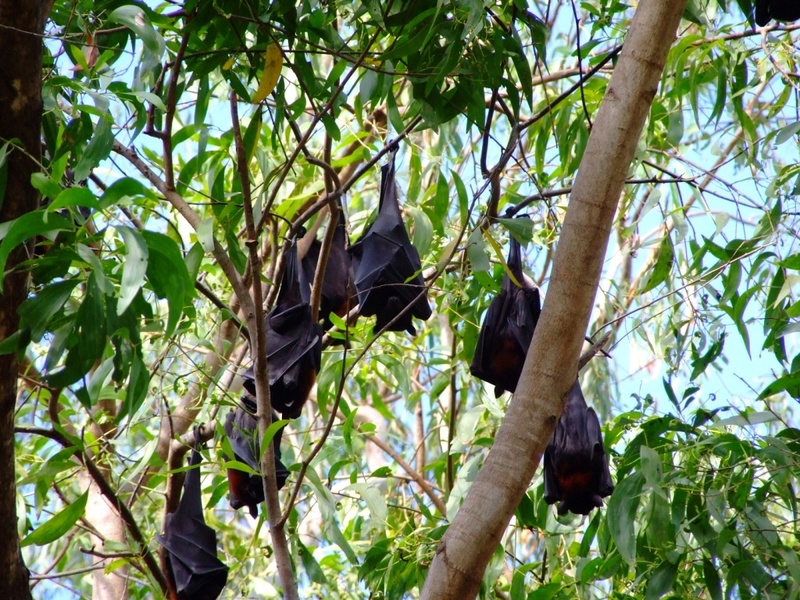 These little vampires are very common in the north of Australia. Sometimes, when I sit on my balcony at night, they come up and hang of one of the trees next to our apartment. With a wingspan of more than 120 cm takeoff and landing can be impressive events! On our way back to Darwin I got a bit bored on the bus, so I took these pictures. 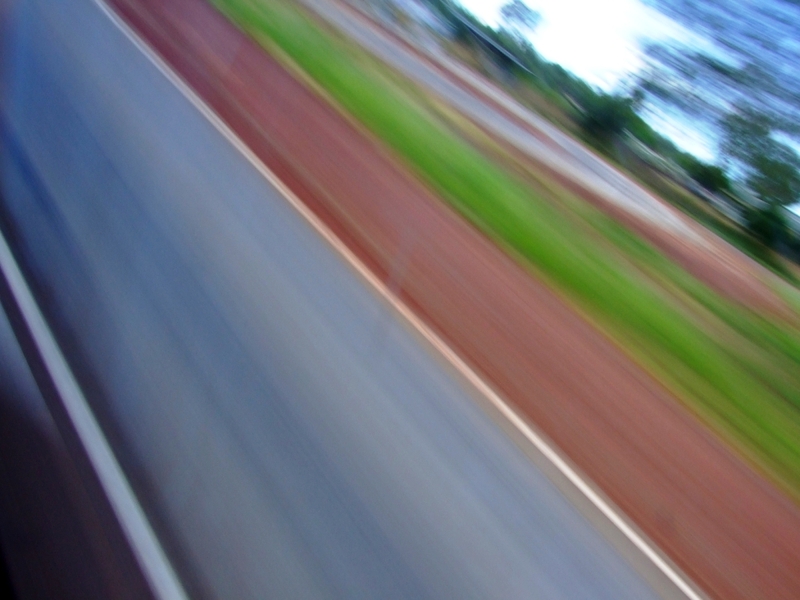 This is what you get when you take long term exposures (e.g. 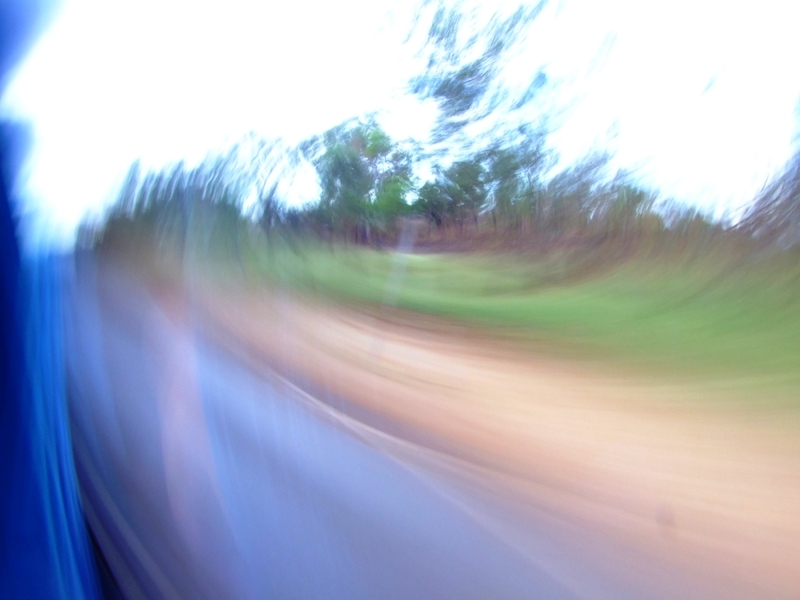 two seconds) out of a bus thats doing a 100 k’s on Stuart Highway. 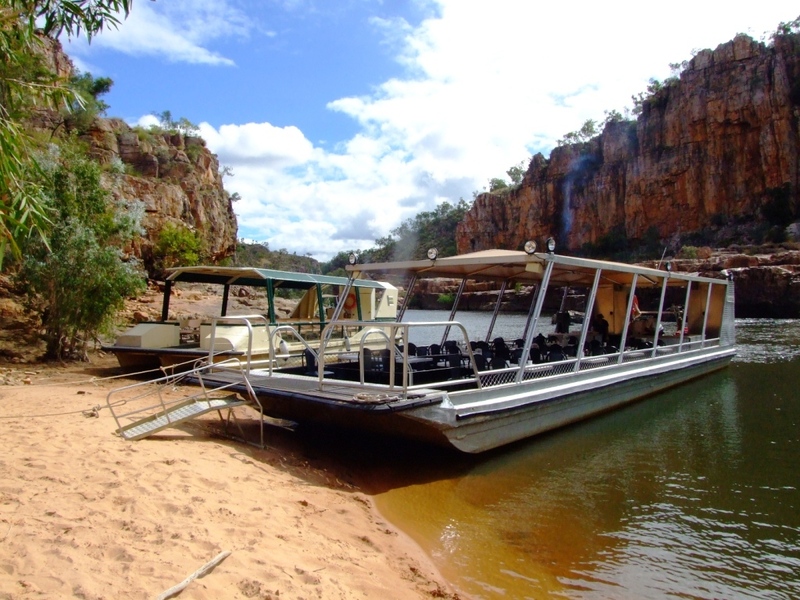 I can really recommend this tour to Katherine Gorge if you don’t mind spending eight hours on the bus, or if you bring a pillow or a good book. 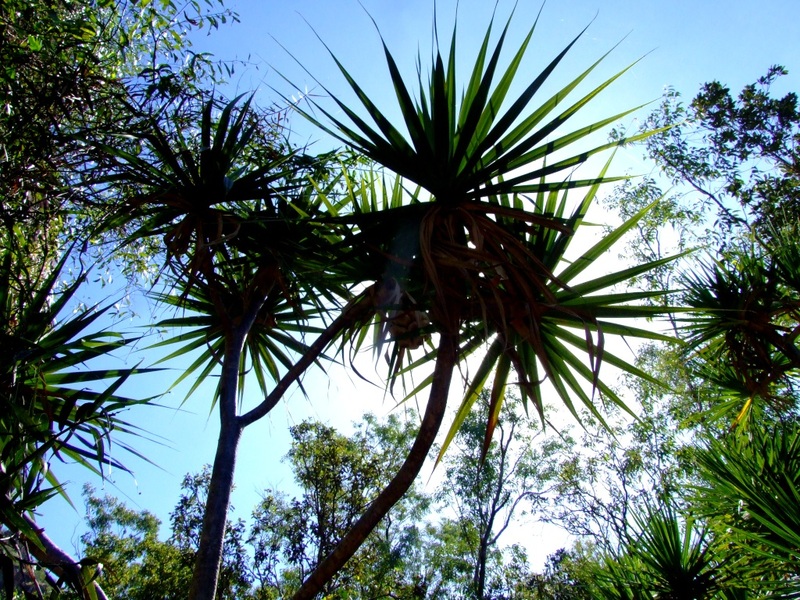 AAT Kings offers this tour for $199, Pinnacle Tours for $157 and with Topend Escapes you can go from $109, depending how much time in advance you make the booking (Prices of July 2010). After this day I only had another two days to work after that for my real days off. On the 31st of July Maryanne and Me went to Singapore and Batam (Indonesia) for a few days. 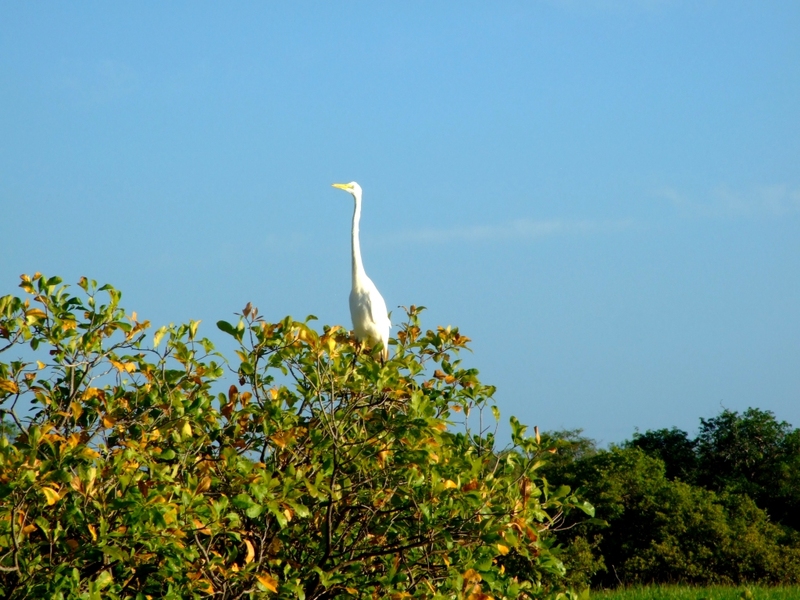 My next post will be about our holiday in South East Asia, of course with lots of photos, as usual. So I had now idea what to expect. 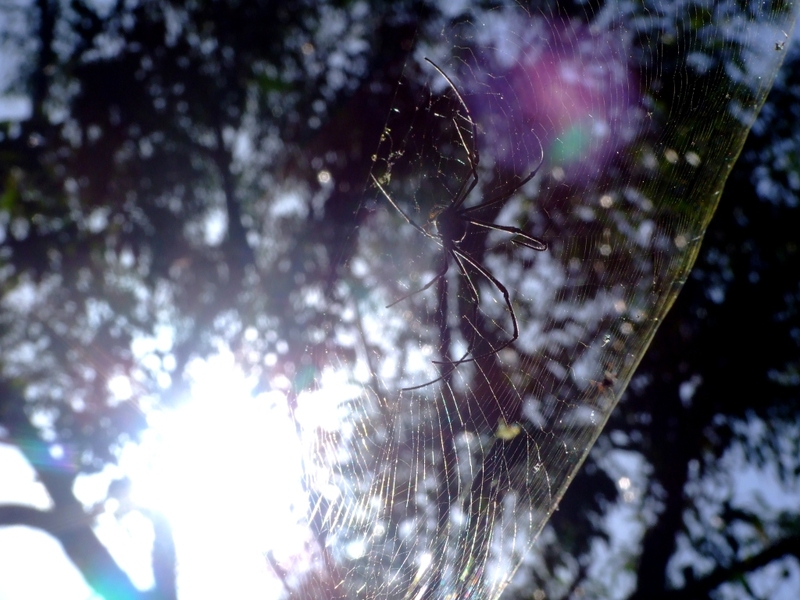 As I mentioned in Part II, there was a surprise waiting for me. My birthday present from Maryanne. 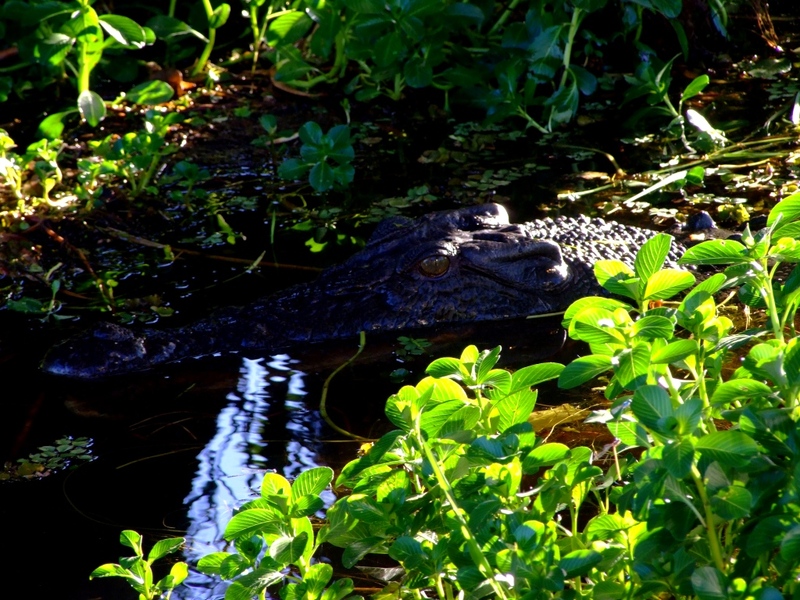 I was wondering, what else was there to do in Kakadu National Park? 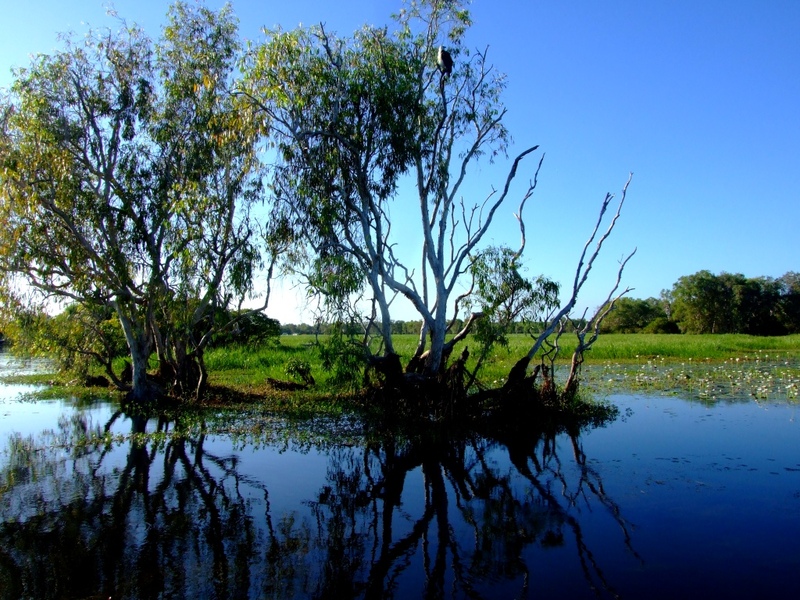 We had done the Yellow Water Cruise, been to Nourlangie Rock and Jabiru. 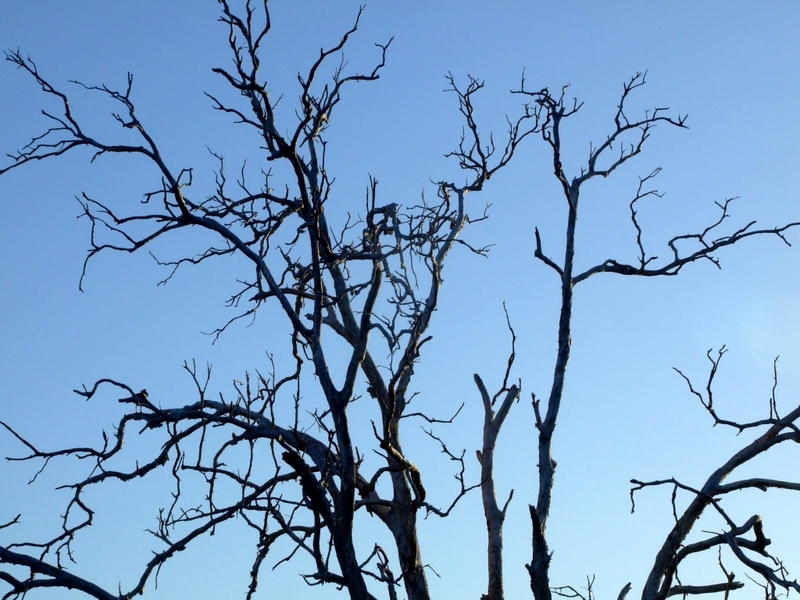 There is not much left to do, especially not something that you have to get up early for. She was driving this time and as she was heading for the dead-end road heading to the old mine, I became an idea of what I might get. I knew where this road goes to. 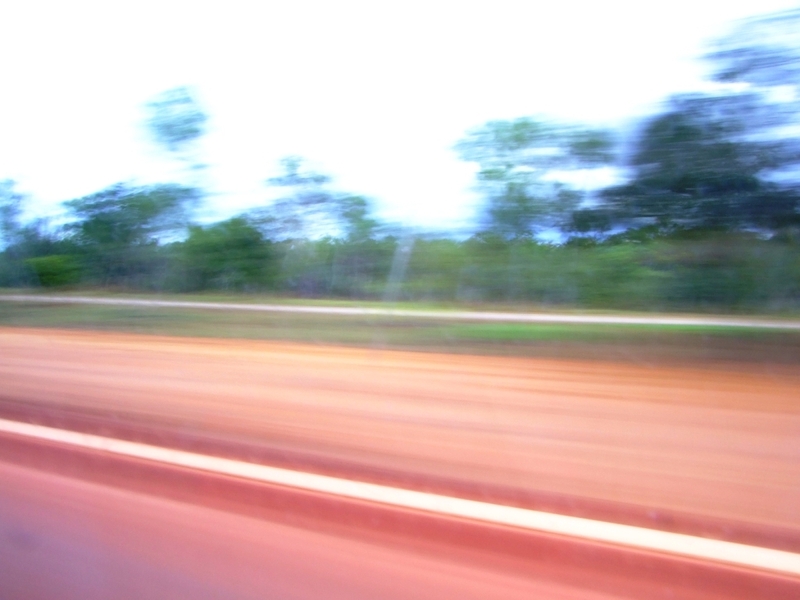 The airport of Jabiru is down that way. A scenic flight. 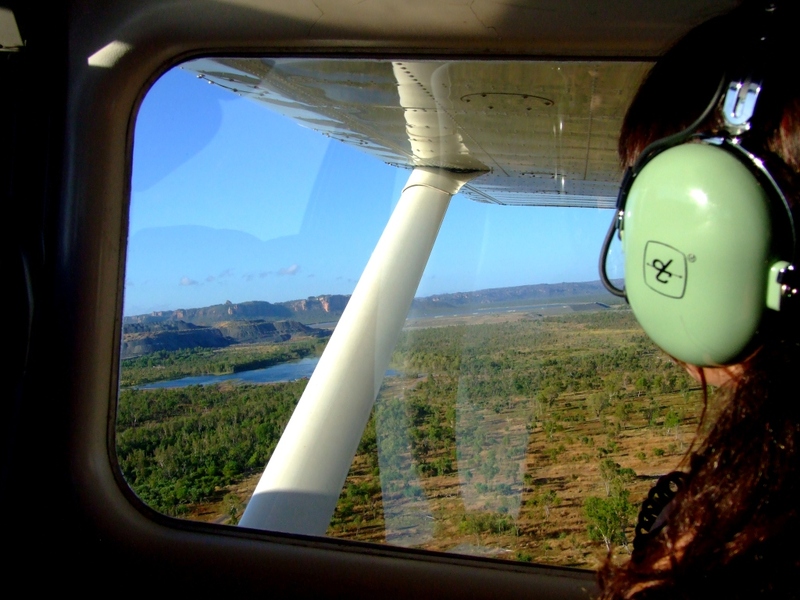 Left: Taking off at Jabiru Airport in a Kakadu Air 6-seater. 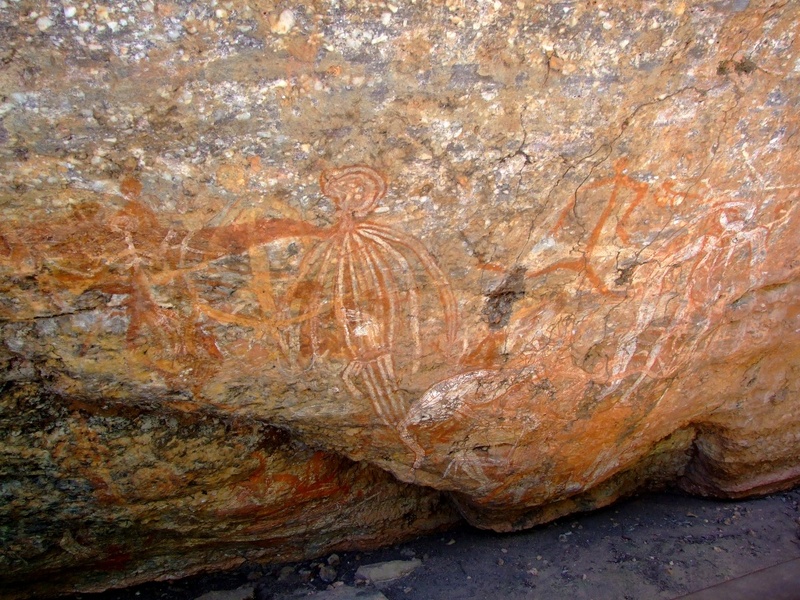 Middle: The first detour went over the town of Jabiru. 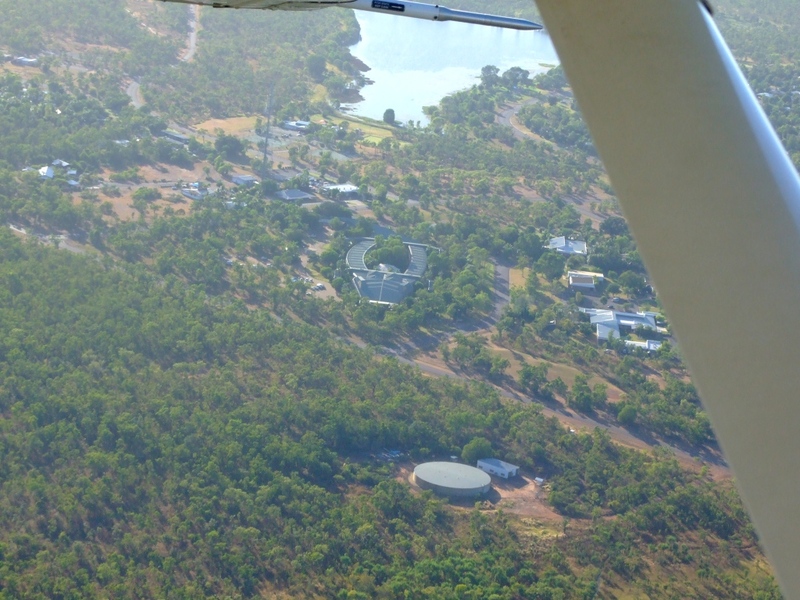 In the middle you can see the Jabiru Holiday Inn in the shape of a giant crocodile. 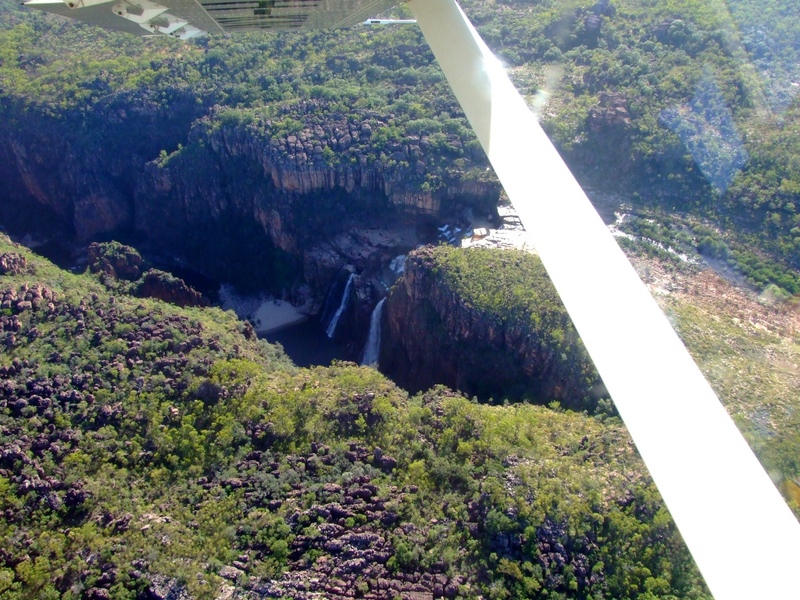 Right: After 25 minutes of flying over the vast plains we got to Twin Falls, which is only accessible by boat. There is no road all the way to the falls. Sorry, I know it’s large, but I wanted to share this picture of the magnificent Jim Jim Falls in full size. 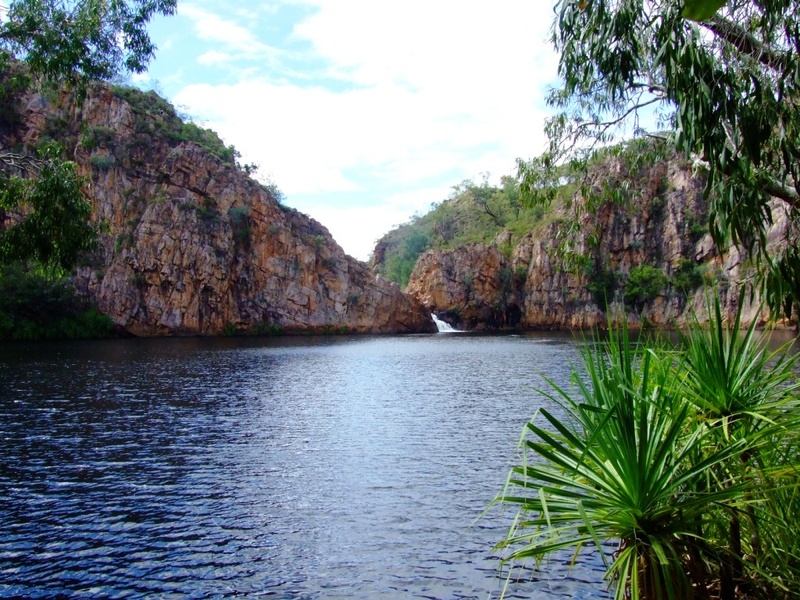 The water falls down more than 200 metres from the Arnhem Land plateau into the shallow Kakadu National Park area. 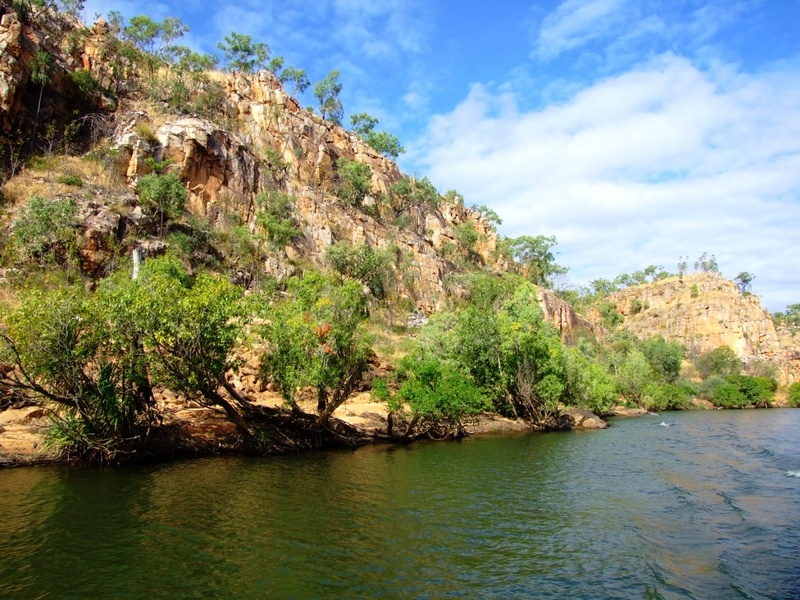 According to geological information, about 150 million years ago, the whole of Kakadu was under the sea and Arnhem Land was only a flat land next to the sea with vertical cliffs on the coast. 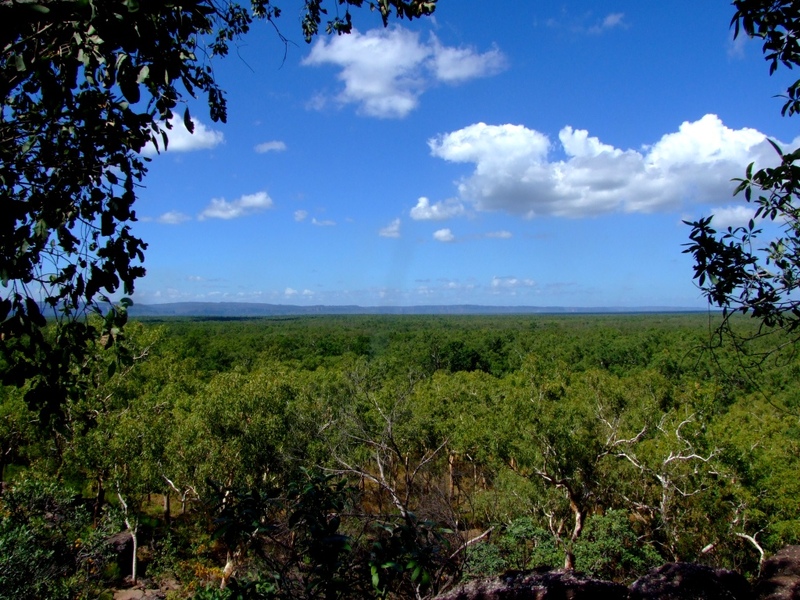 Today the Arnhem Land plateau rises up to 330 metres at its highest points. In the wet season there are tonnes of water flushing down the falls, much more intensely than on my pictures which was taken at the beginning of the dry season. 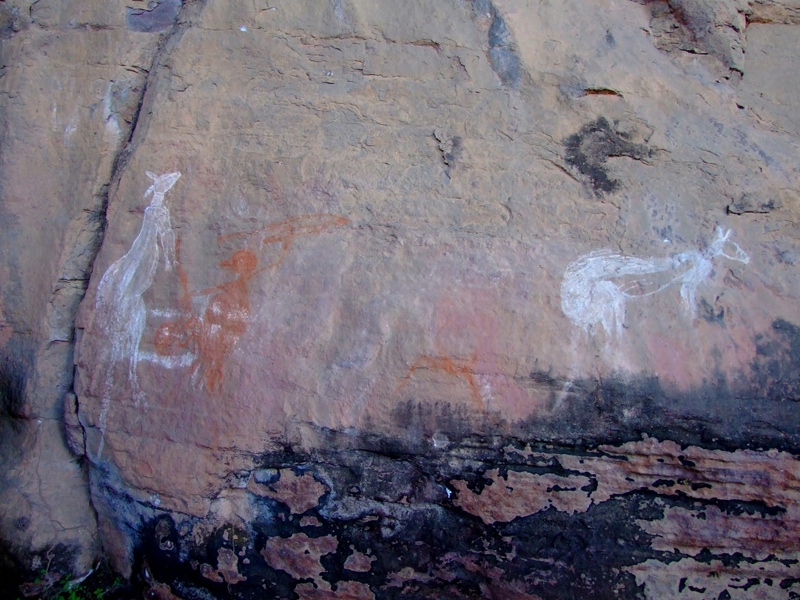 For a public picture of Jim Jim falls in the wet season click here (external link). 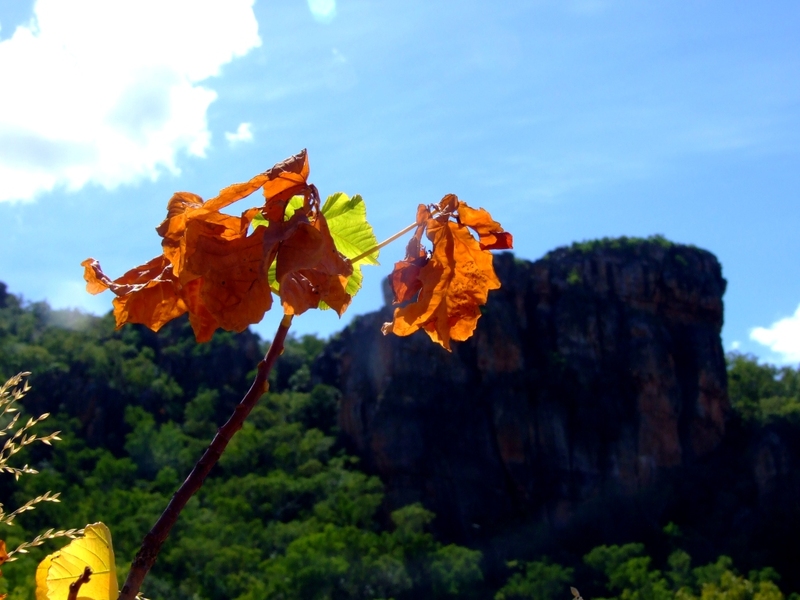 In the dry season the waterfall can dry out almost completely. 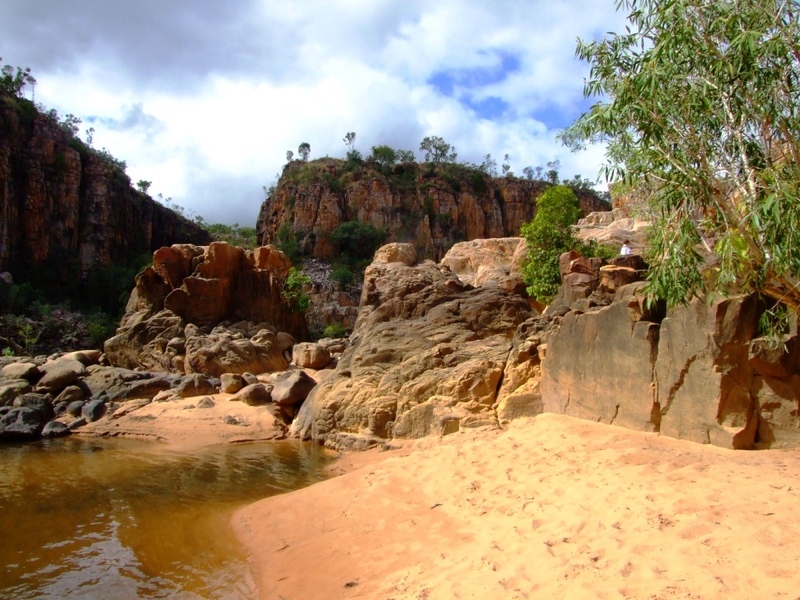 There is a 60 km dirt road to Jim Jim Falls but it is for 4WD only and only accessible in the dry season. 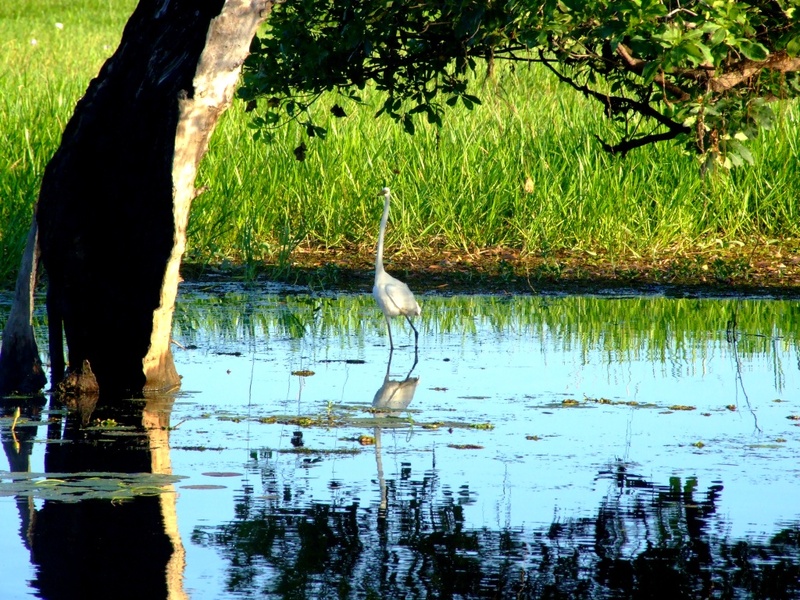 In the wet season there is no way at all to access the area in a vehicle. 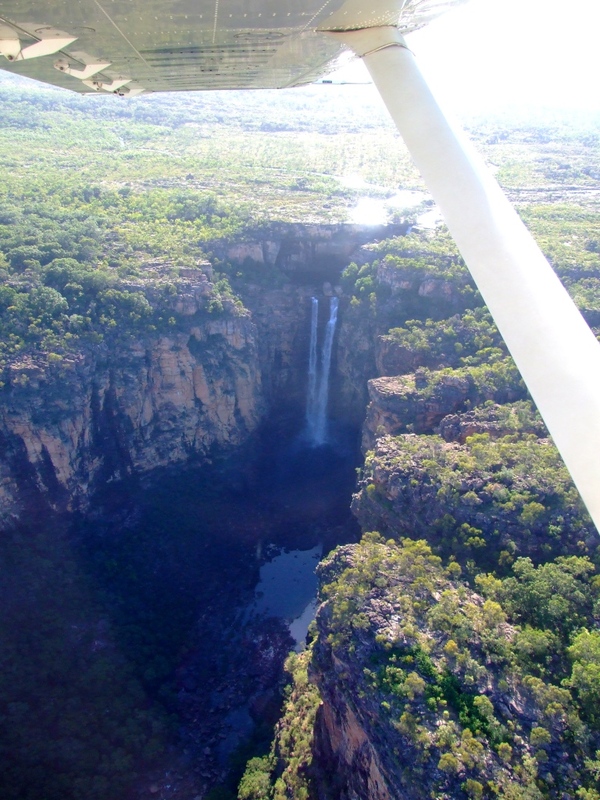 All pictures you find from the falls in the wet season were taken from a helicopter or an aircraft. 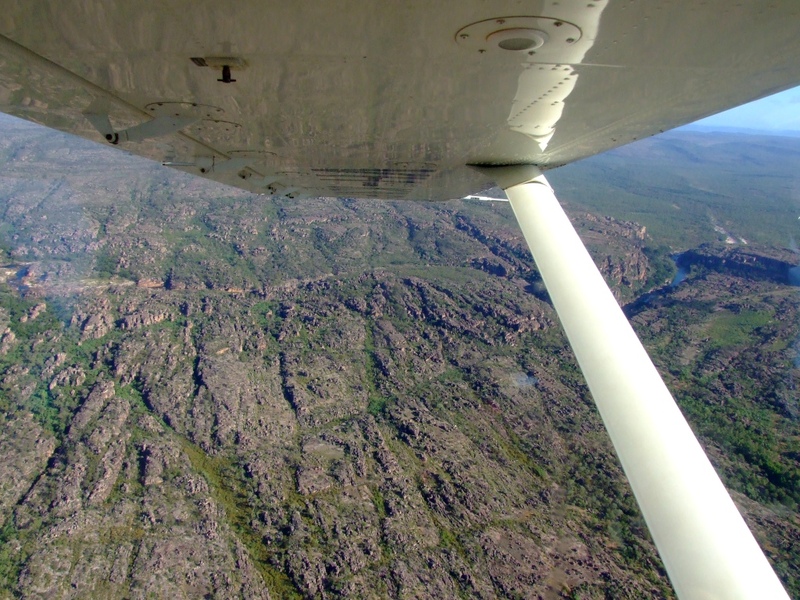 Left: Flying over the Arnhem Land Plateau. Middle: Returning to the hotel and checking out. 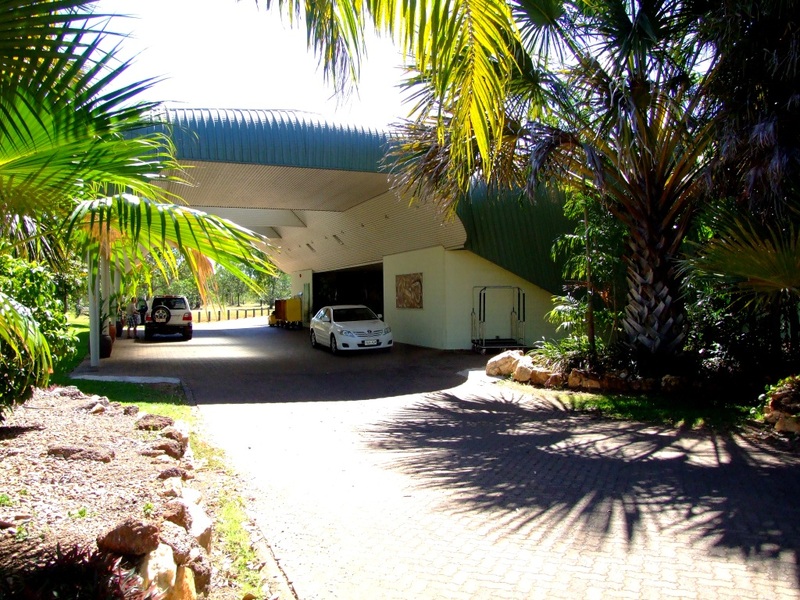 The entrance of the crocodile shaped Holiday Inn is a giant crocodiles head, you enter the lobby through the mouth. 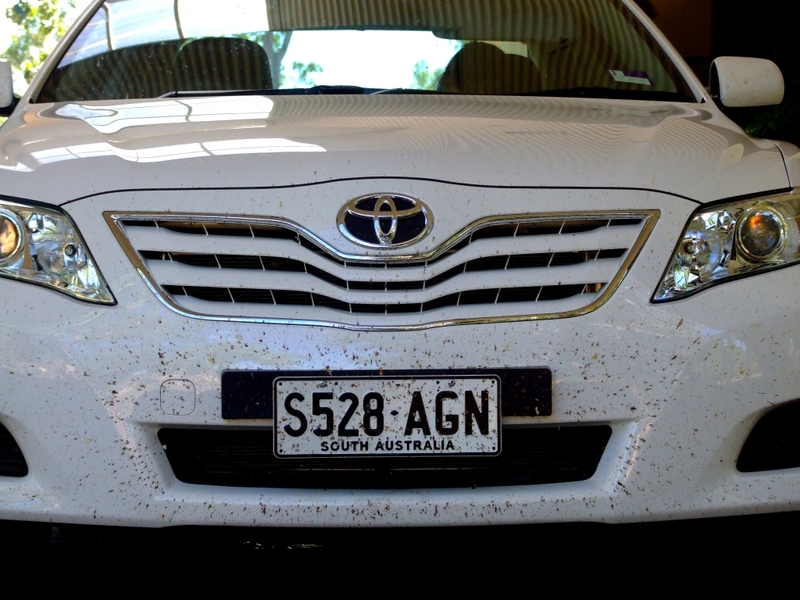 Right: Hundreds of flies and other insects have died on the bumper and bonnet of our 2010 Toyota Camry. 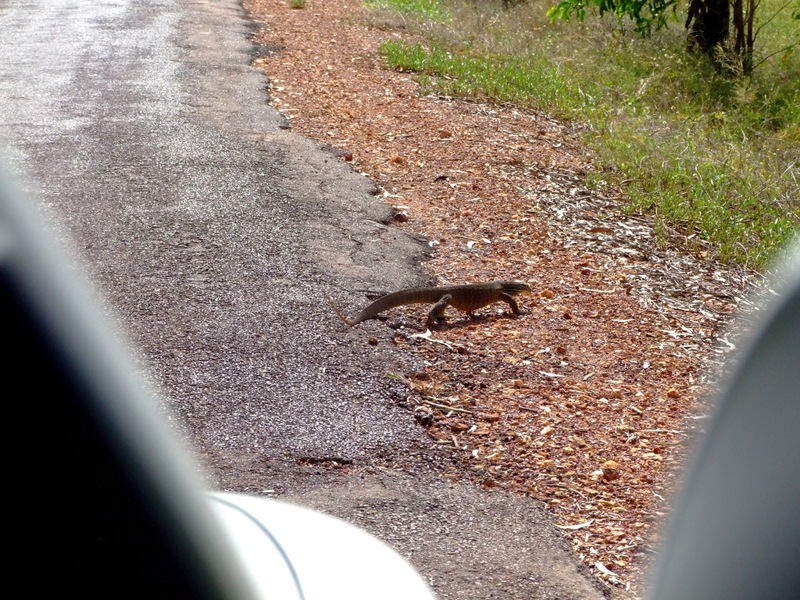 Left: On the way home we stopped at Fogg Dam, where this little creature crossed the road. 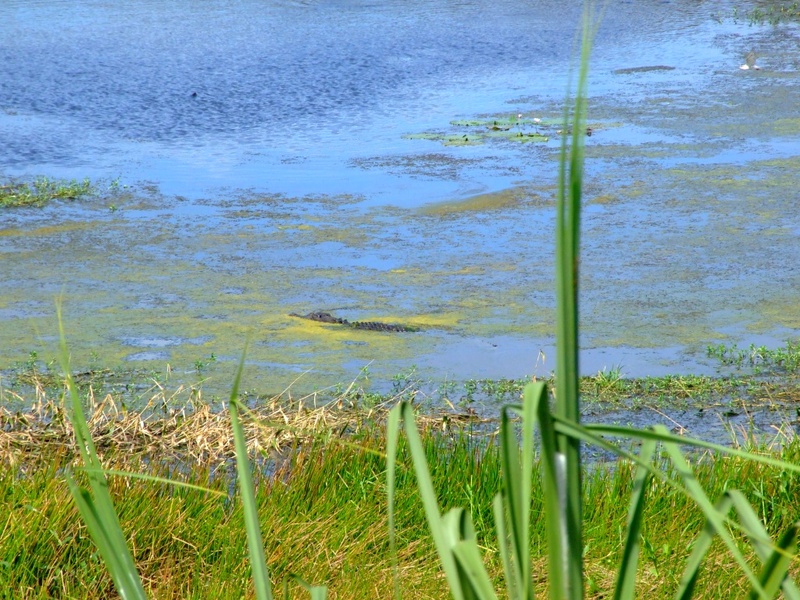 Middle: From the car park at Fogg Dam we saw this 4-metre saltwater crocodile. 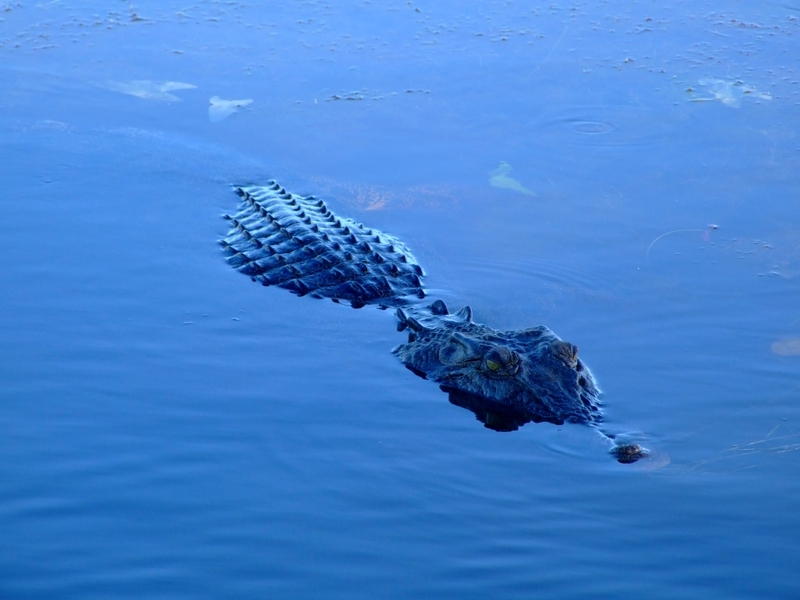 It could easily walk up to the road and nibble on us tourists, but it decides to stay in the water. Right: Getting back into our Toyota Camry. 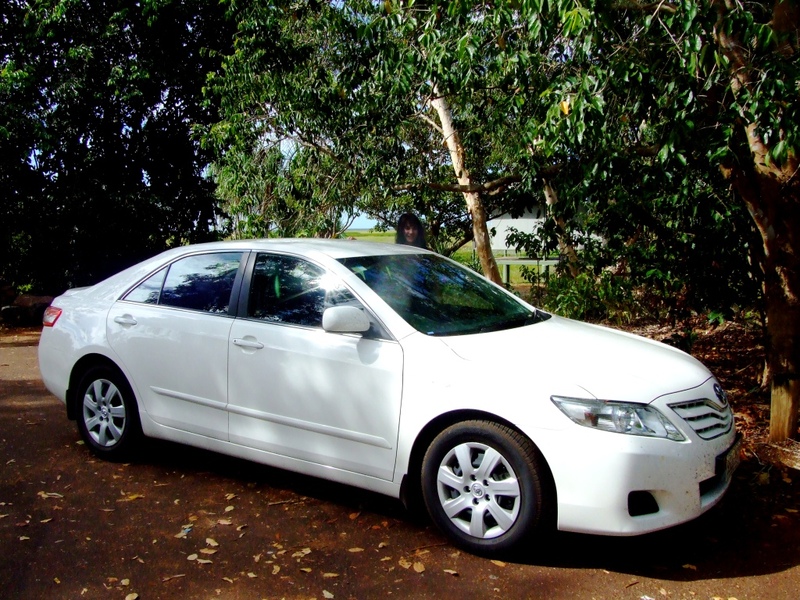 This hirecar had only driven 600 kms when I picked it up in Darwin. 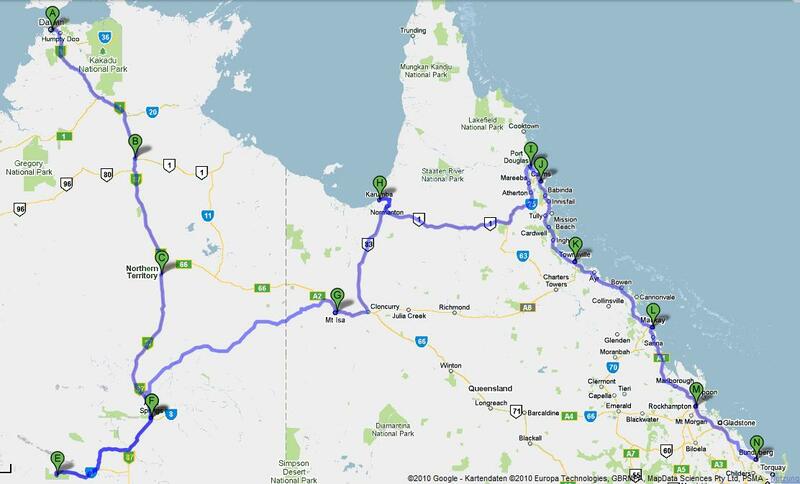 Well, we arrived back in Darwin at around 5.00pm on Saturday and had a quiet night. I had to get up early for work the next day. 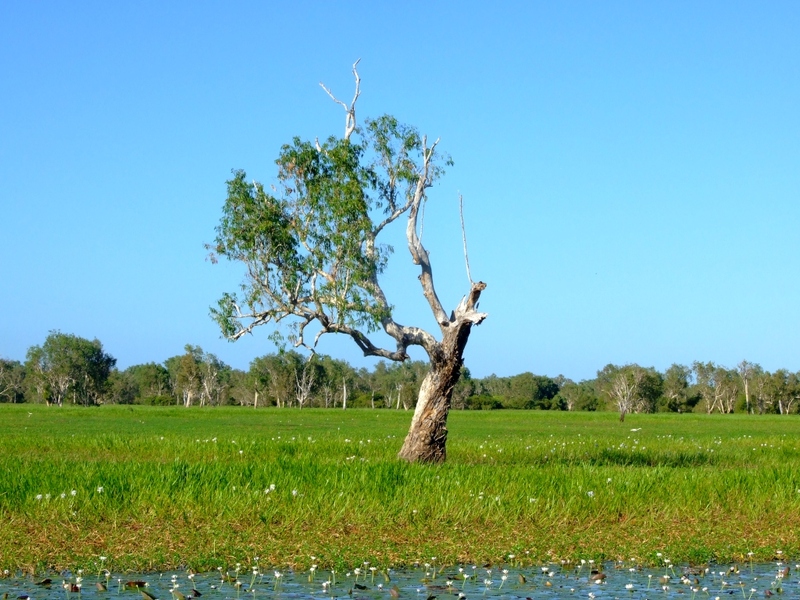 If you want to see all the photos I took in Kakadu National Park, click here to view the entire album (144 photos) on flickr.